Dawn Bowden AM said “I am really pleased that this Saturday (24th November) we will plant a tree in Cyfarthfa Park to mark the centenary of women’s suffrage. We know that Rose Mary Crawshay was a suffragist but we want to plant the tree to also mark the contribution of so many other remarkable women from, and still today in, our community”. Dawn added “As the first woman to ever represent Merthyr Tydfil and Rhymney in either the Westminster Parliament or the National Assembly for Wales it is a great pleasure to have helped organise this event in which we can remember those women who helped to ensure that in 1918 our country became more democratic and started to give a voice to women through the ballot box. In addition to planting the tree we will hear more about a local Suffragette Jessica “Jessie” Arscott, from Aberfan, who was jailed in London after protesting for the vote. While in jail she was visited by Keir Hardie MP who himself was a strong advocate of votes for women. 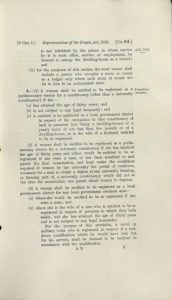 As the website of the UK Parliament states “In 1918 the Representation of the People Act was passed which allowed women over the age of 30 who met a property qualification to vote. Although 8.5 million women met this criteria, it was only about two-thirds of the total population of women in the UK”. Our thanks go to the Leisure trust for their cooperation with this event. Please meet on the forecourt of the castle at 11am if you want to join the event and there is a warm welcome to all. It would be a nice touch if we wore the colours of the suffragette movement – purple, white and green.